Missed Altreonic at Electronica 2010 in München? Missed Electronica-2010 and you were looking for enabling technology for embedded systems? 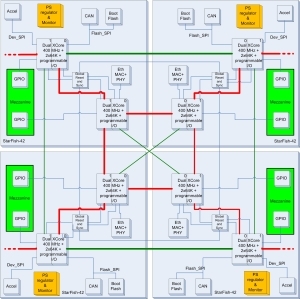 controllers that can be scalable as well as fault tolerant. Order the OpenComRTOS suite v. 1.4 for ARM-M3 and Win32 before 31.12.2010 at a special price of 9990 euro and get a Luminary ARM development kit for free. This is our latest release and an ideal way to experience how easy parallel concurrent real-time programming can be. Take one of the supplied examples, modify it or just remap some of the tasks to another node with no source code changes. The visual modelling environment and its code generators make even programming the C code very straightforward. Contact us at info.request (@) altreonic.com for more details. Download our presentation on "Concurrent systems composing in a reliable and efficient way". Abstract: Push button high reliability might sound like a clever marketing slogan, but at Altreonic we make it happen. The key to it is combining a long experience with a formalised approach. This allows us to make systems smaller, more reliable and thus better. It is a formalised process that works because the human side has been taken into account. Unified semantics is hence one of the expressions you will often hear at Altreonic. The result is that safety engineering is now within reach of small and medium sized companies. Access the full presentation here (30 minutes). Or have a look at a 3 minutes video interview by ICC Media. See it here. 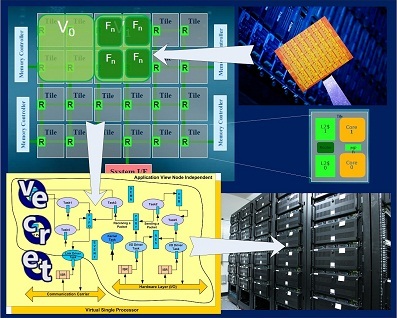 Ultra low power applications. Code size matters. Distributed sensing and control. Because OpenComRTOS is concurrent at the core. Scalable processing system. Because OpenComRTOS disassociates topology from the application. Fault tolerant processing. Because redundancy is natural for OpenComRTOS. Feel free to visit our website at www.altreonic.com for more details or download the Windows version of the OpenComRTOS suite for free. Learn how concurrent, parallel real-time programming can be more natural than shared memory sequential or multi-threaded programming. Interested? Contact us at info.request (@) altreonic.com or register for our newsletter. Altreonic is now looking for partners world-wide. Programming parallel systems with many processor cores has been at the core of Altreonic’s technology for many years and hence it was natural for Altreonic to join in the effort as it already has proven technology. Altreonic’s scalable and formalized technology gives more for less. Altreonic is now announcing two new products that clearly demonstrate how a formalized development can result in more scalability and less energy consumption. First we present our brand-new Safe Virtual Machine for C in just 3.8 KB. Next we present a port to the ultra low power CoolFlux DSP core of NXP. Formalized development is more than verifying correctness, it actually results in cleaner, more efficient and more scalable architectures. Altreonic will present at Intel's ERIC 2010 conference in Braunschweig, Germany under the title "Ubiquitous computing with a unifying programming model", fitting well in one of the focus areas: many-core / parallel processing. The conference takes place from 21st till 22nd September 2010. For details and registration visit Intel's web site. 13:30 An Architecture for Scalable Concurrent Embedded Software. E. Verhulst, Altreonic. and as invited guest speaker on the conference (29 Sept) with as subject "Present and future challenges in developing a manycore RTOS"
Altreonic will be speaking at the 9th International Conference and Workshop on Ambient Intelligence and Embedded Systems (AmiEs-2010) Friday 1st October with as title "An integrated and formalised systems engineering methodology with integrated tools for embedded applications. See the conference website for more details and registration. Altreonic is now pre-announcing its new high reliability StarFish product range. Designed as a scalable and customisable range of embedded controllers, it can handle a wide range of real-time embedded applications. The basic building block is the StarFish-42. It has two dual-core 400 MHz 32Bit processors, each running up to 8 threads in the hardware. Supported by the formally developed OpenComRTOS, large networks of processing nodes can be transparently programmed. For this purpose StarFish hosts a wide range of communication and I/O capabilities like 100 Mbit/sec ethernet, CAN and direct links for inter block communication.